Patrick plans to lobby for newly-introduced landside reforms at Port Botany to be changed, claiming the scheme has had little effect on efficiency. Less than a month into the Port Botany Landside Improvement Strategy (PBLIS), a spokeswoman for Patrick says trucks are still arriving late to slots. The NSW Government introduced PBLIS on February 28 to improve truck turnaround times. Stevedores must pay trucking operators if drivers are forced to queue. Trucking operators are also penalised for arriving late or not turning up at all. "There’s been no significant improvement," the spokeswoman says. "We will definitely continue to meet with both sides of government and continue to push for an alternative." The spokeswoman claims trucking operators continually arrive late due to traffic congestion. While no figures have been released, she says Patrick is servicing vehicles under 40 minutes on average. "We’re certainly paying a lot less out [in penalties] than we’re taking in," the spokeswoman says. Patrick wants the regulations examined to look at making them more flexible, the spokeswoman says, such as allowing trucks to enter the terminal earlier than their booking time. Mike Moylan from the NSW branch of the Australian Trucking Association (ATA) says it is too early to tell if the scheme has been successful. "We’re just at the start of it. I think everyone needs to chill out and not get ahead of themselves," he says. He questioned Patrick’s claims about poor turnaround times because analysis on truck movements in and out of the port has not been released. PBLIS monitors truck movements using in-vehicle electronic tags and fixed cameras and clocks at entry points. Moylan says he is not surprised by Patrick’s comments because the stevedore has long opposed government intervention into the running of the port. "They want to go back to yesteryear when they had the whip hand," he says. Under paid waiting times, stevedores must compensate trucking operators $25 for every 15 minute delay, $100 if a booking slot is cancelled within two hours of the agreed time or $50 if the slot is cancelled outside the two-hour timeframe. Trucking operators pay $50 for a late arrival and $100 if their trucks do not show up. The stevedore last year unsuccessfully tried to strike a deal with the trucking sector to avoid government intervention. It proposed an $80 late payment to trucking operators in 15-minute increments if the average turnaround time exceeded 50 minutes. Patrick suggested a $60 fine for trucking operators whose vehicles did not show up at a designated time. Under its scheme, Patrick said it would open more booking slots to meet demand and consider finding alternative time slots for operators if they showed up late. 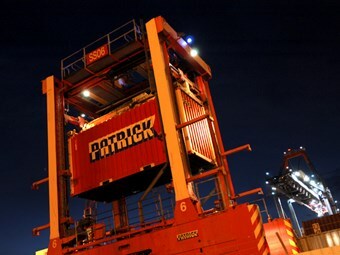 The spokeswoman for Patrick says the stevedore recognises it needs to work with Sydney Ports and the trucking industry under PBLIS and that it supports recipocral penalties. Moylan, who is also the general manager of wharf operator Johnston’s Transport, is critical of Patrick’s decision to increase vehicle booking slot charges and phone booking fees. The booking slot charge will increase from $4.75 to $9.75 on March 28, while the phone booking fee will rise by $5 to $20. Patrick’s Sydney terminal manager Scott Forster says the increases are necessary due to the high costs in complying with PBLIS, such as installing cameras and clocks at entry points to the terminals. He says Patrick is also incurring costs to train staff and administer invoices. "Why are we paying manual processing costs? Shipping companies have always paid that," Moylan says. He believes Patrick’s customers – the shipping lines – should pay. He says Patrick finds it is easier to slug the trucking industry because operators have no choice but to accept the charges. "If we want to go to the terminals we have to sign up to VBS. The easy way out is to charge the carrier who has no choice," Moylan says. Patrick announced the increase in fees on March 15, and Moylan says operators will not have enough time to pass on the costs before they are introduced. ATA NSW manager Jill Lewis says she is considering lodging a formal complaint to the Australian Competition and Consumer Commission and the incoming NSW government about the charges, which were approved by the Sydney Ports Corporation. CLARIFICATION: Based on comments provided by the stevedore, ATN reported on March 17 that Patrick wants paid waiting times scrapped. This is incorrect. Patrick says it understands the need to work within the PBLIS structure and that it supports reciprocal penalties.